I admit it, I have a problem. 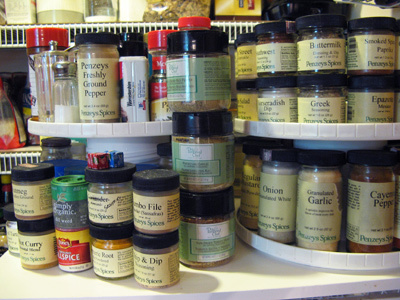 I have an addiction to all things spice and have collected an increasing number of jars and bags of spices that overwhelm my pantry. I just can’t seem to help myself. Every so often I have to reorganize the pantry so that I can make a little more space for my obsession. 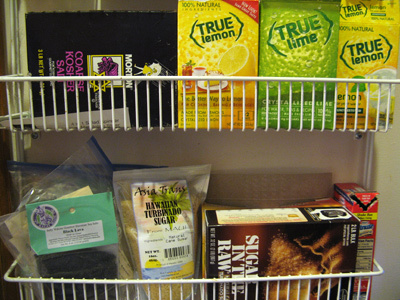 Well, I decided that a little Spring cleaning was in order so I set out to reorganize my pantry. What a job! I have a small kitchen and need every little bit of space so we converted the laundry room that was in the kitchen to a pantry. Joe put in shelves and racks and a cart just to hold all my small kitchen appliances, pantry foods and spices. So I set off on my mission . . . I piled all my bags on the table and set about filling any jars that were low. I made a list and anything that ran low or empty was put down for a Penzey’s run. As you can see I have a lot of spices that I go through regularly and it’s cheaper to buy a bag and refill the jars than to buy new jars. Okay, got everything filled and back on the shelves. I’m shocked that I have 62 different jars of Penzey’s spices alone! Here’s my newest obsession from The Tasteful Olive. 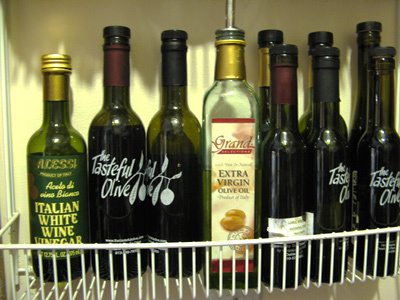 Once I get in that store and the tasting begins, there’s no getting me out of there without a bottle or two of flavored olive oils and balsamic vinegars. 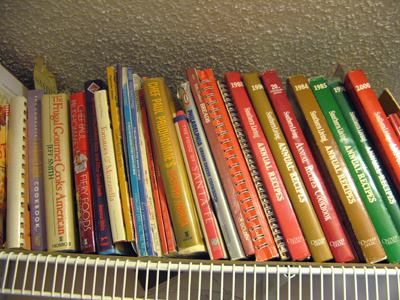 My cookbooks are old and worn down but I still pull them down from time to time. There are some classics up there! I keep a step ladder in the pantry to get to the high stuff and even the not so high. Standing at only 5′ everything is out of my reach. 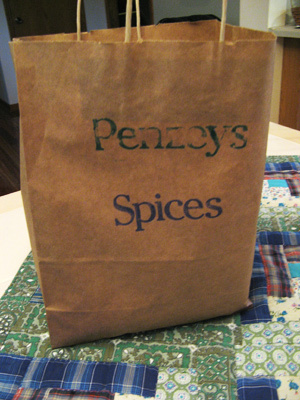 I have a few things on my list and a couple coupons for free spices so it’s off to Penzey’s to re-stock! 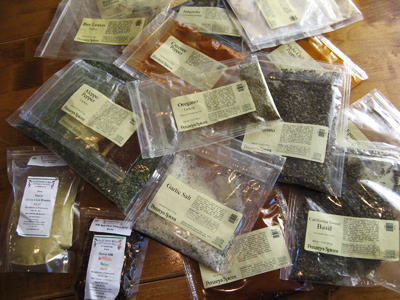 It’s like spice heaven when you walk in and the air is filled with an amazing aroma. They have glass decanters filled with every spice to tantalize your sense of smell. I tell you, there’s no way to get out of that store without a basket full. At least I can’t. Oh boy, what did I do! I keep telling myself that I got 2 jars free but lets face it I’m a spice aholic. I am also a huge Penzey’s fan! I’m telling ya…I WANT TO BE YOUR NEIGHBOR!! Then I could cook with you AND visit a real, live Penzey’s store, lol! 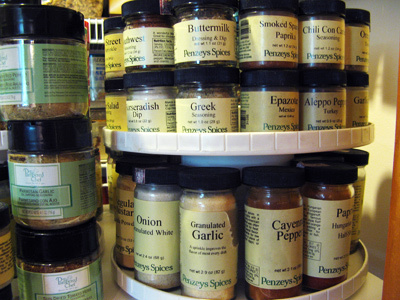 It’s not always obvious in my cooking pictures because I’ve been refilling old grocery store (McCormick and such) bottles with Penzey’s stuff since I also purchase our favorite spices in bulk. 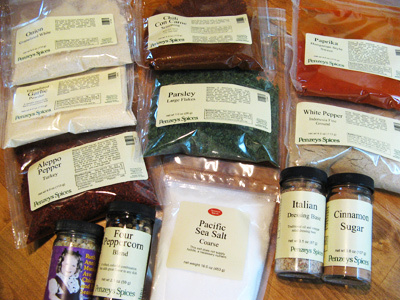 Having never made curry before I went to Penzey’s and bought small jars of almost every blend they offer. You can see it here http://justafrugalfoodie.com/2012/02/28/looky-looky-hurry-hurry-i-got-curry-i-got-cur-umm-so-now-what/ I still haven’t made my curry yet though…so many recipes, so little time! I hear ya! 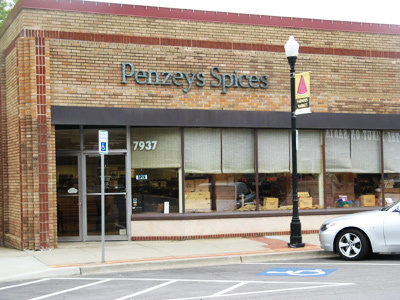 I used to mail order my spices through Penzey’s until they opened the store here. And there lies the problem, it’s just too convenient. I look forward to seeing how your curry turns out!